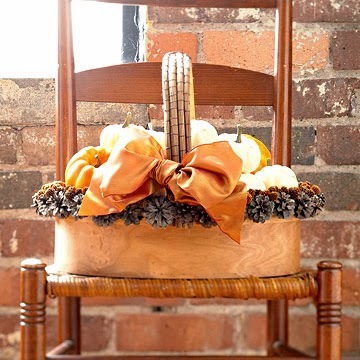 Fall Harvest Basket ~ Rimmed with pinecones and casuarina pods, this bentwood basket is ready to hold the fruits of your harvest. 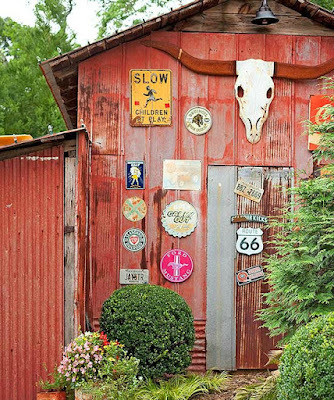 Golden pecan stain gives the inexpensive container a rich patina. 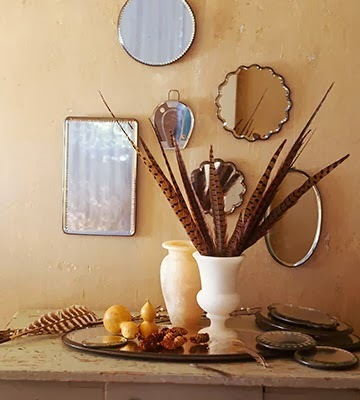 Simplicity Reigns ~ Dress up a side table for Thanksgiving with a simple arrangement of tall pheasant feathers in a ceramic urn. Surround with small gourds, pinecones, and loose feathers. Elegant Acorns and Pearls ~ Add a touch of elegance to an autumn element using luminous pearls. Glue acorns to a crafts-foam wreath, placing the caps squarely on its surface. Mix whole acorns and acorn caps for a natural look. 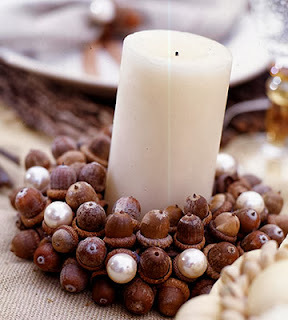 Hot-glue large pearl beads to some of the acorn caps to add pops of pearly white to the rich brown ring of nuts. 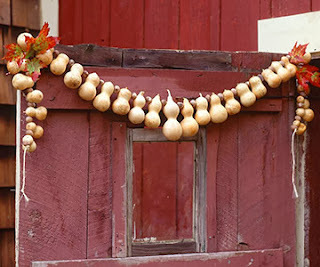 Gourd Garland ~ Drill holes through dried gourds and English walnuts (with husks still attached), and alternately string them on heavy-duty twine for a harvest swag. 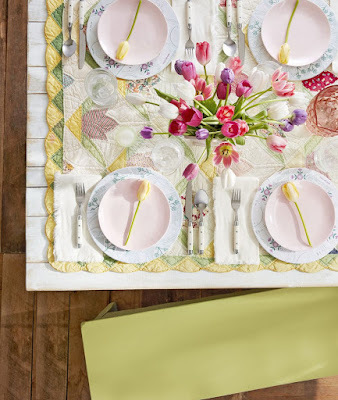 Tuck a spray of vibrant leaves in each corner to add a pop of color and hang the swag indoor or out. See next slide for a detail shot. Seasonal Addition ~ Adding touches of fall to an existing display makes decorating for Thanksgiving a snap. 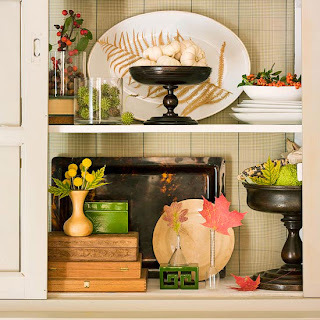 Fill favorite bowls and urns with leaves, berries, and small gourds. Once the holiday is over, simply toss the faded natural elements -- no packing or storing of seasonal items required. Corn and Candles Display ~ Elevate a basic pillar candle to Thanksgiving-worthy status. 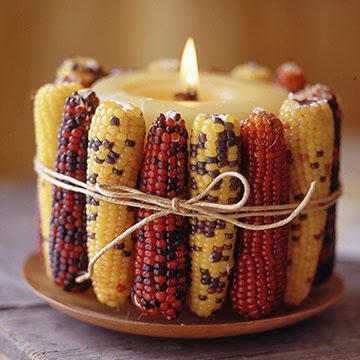 Hot-glue ears of Indian corn around a pillar candle and tie twine around the arrangement. 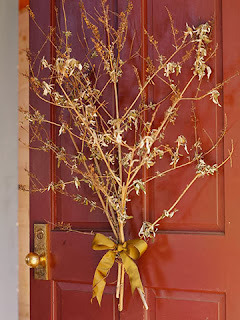 For a more elegant look, substitute pretty satin ribbon for the twine. Proper Place ~ Such a lush arrangement of fall leaves would be overwhelming on a dining table. But oversize branches make a bold Thanksgiving decorating statement. Fill a tall bucket with large fallen branches. Place the arrangement on a table near the front door to set the harvest mood as soon as guests arrive. Simple containers of small gourds and mini pumpkins add additional color without distracting from the main event. 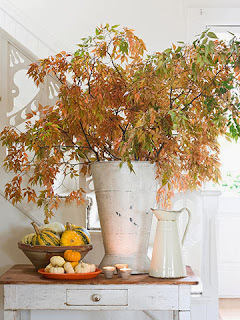 Multicandle Fall Centerpiece ~ Cast a soft glow over your Thanksgiving table with a multicandle centerpiece. Bundle large pillar candles together (we used nine) with a length of wide satin ribbon. 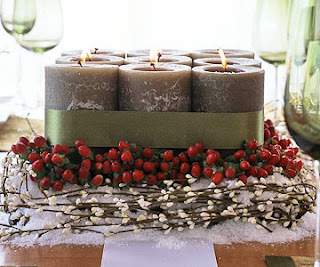 Surround the base of the centerpiece with bittersweet or greenery to take you from Thanksgiving to Christmas. 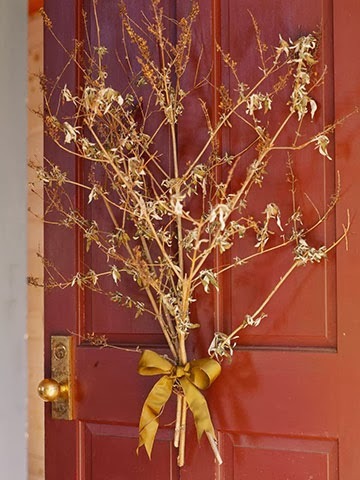 Wreath Alternative ~ Tie a few branches together with a bright satin bow and hang on your front door for a new take on wreaths. Lay sticks flat and arrange in a fan shape, crisscrossing the ends. 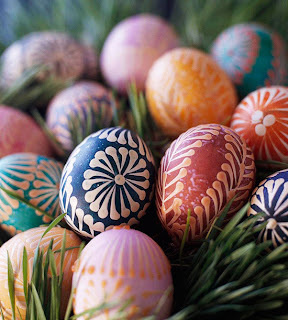 Tie them together with wire, winding it around the branches as needed to keep them stable. Tie a ribbon over the wire, or simply attach a bow with wire or hot glue. Change the ribbon color to transition from Thanksgiving to Christmas. 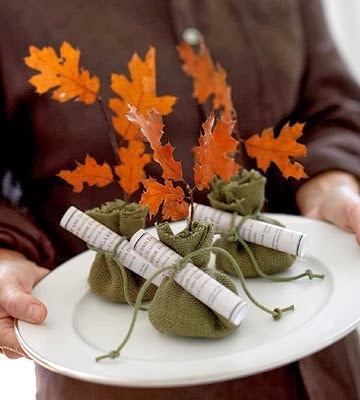 Fall Tree Favors ~ Say "thank you" to your guests with a favor of a tree planted in their honor. 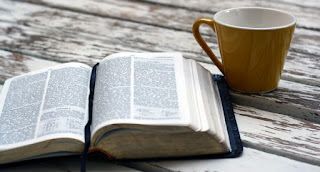 (Arborday.org offers the service.) Present the certificate tied to a fallen or dried leaf twig wrapped in burlap. 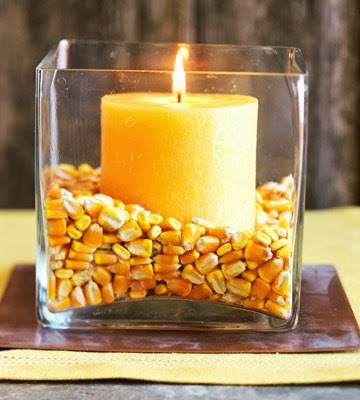 Candle Display with Corn ~ The most beautiful candle displays are often the simplest. For a modern touch, place a pillar candle in a clear, square glass container, then add corn kernels about halfway up the height of the candle. 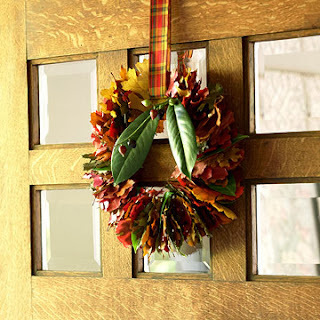 Fall Leaf Wreath ~ Welcome guests with an easy-to-make leaf wreath. 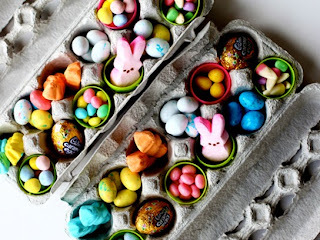 Using small scissors or a utility knife, cut slits in the centers of fresh leaves or pliable dried ones from a crafts store. String the leaves onto a wire wreath form until full. Hang from a pretty ribbon.